Details view: Colors and arrows? What do the different colors and arrows mean? 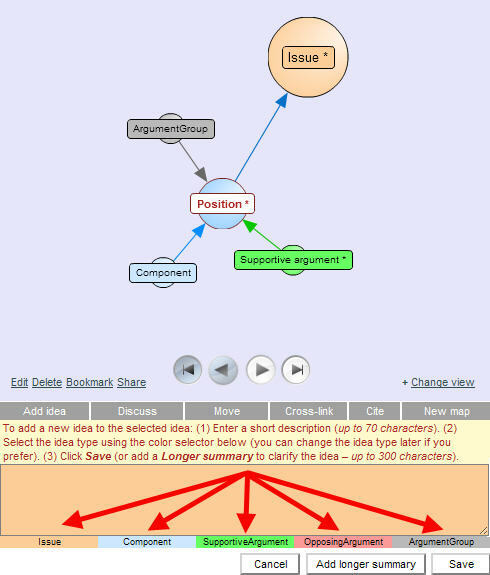 You can build conventional mind maps just by using the Issue idea type; however, DebateGraphs come to life as you begin to recognize and apply the meaning of the different colored spheres and the arrows. expressing the ideas and relationships visually. 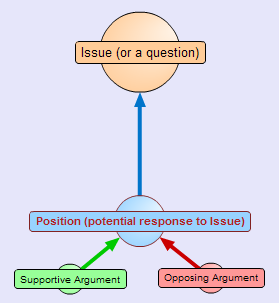 In the simplest case, Issues (or questions) are raised, Positions (or potential answers) are suggested in response to these Issues, and Supportive and Opposing Arguments are advanced for and against the Positions (and each other). 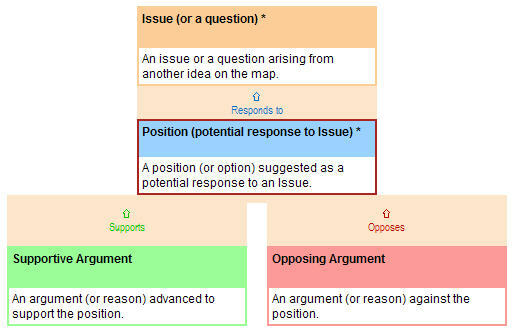 Each building block has its own color (and associated arrow color) so that the types of ideas and relationships can be seen at a glance – and the core building blocks (Issues, Positions, and Supportive and Opposing Arguments) can be combined and recombined multiple times to build maps on any scale. You can gradually learn the meaning of the different idea types as you go along, and, to help you when adding new ideas to a map, the DebateGraph idea selector suggests the idea types that tend to be used most in the current context. Note: As well as the core set of idea types and relationships described above, customised sets can be created for different domains of knoweldge and different types of maps. 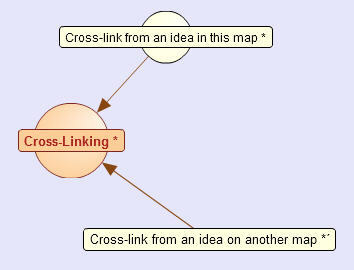 The Cross-link button lets you make direct, meaningful connections (cross-relations) between ideas anywhere on the same map or on different maps. Display or list the idea that you want to cross-relate to on either the Outline or Search tab. Select the idea that you want to cross-relate from on the map. Click on the Cross-link button. Click on the target idea (on either the Outline or Search tab). Click on the intended type of cross-relation from the menu that appears to complete the cross-relation. > A cross-link from an idea in the current map has a sphere and label: a cross-link from an idea on another map has a label but no sphere.